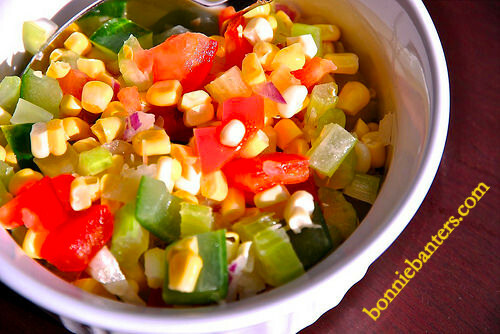 Bonnie Banters: Crunchy, Chopped Fresh Summer Veggie Salad and A Real Smok'n Cookout! Crunchy, Chopped Fresh Summer Veggie Salad and A Real Smok'n Cookout! My son recently ordered a custom smoker. We thoroughly enjoyed being his guinea pigs for all the marvelous goodies he's so passionately produced on that smoker (which I dubbed "Ye Ole Smokey")! Our first tasting was the Mother's Day cookout. It was so great, the guys asked to be reinvited for more smok'n on Father's Day. All this in preparation for a huge cookout in June with a Dallas TV show theme. 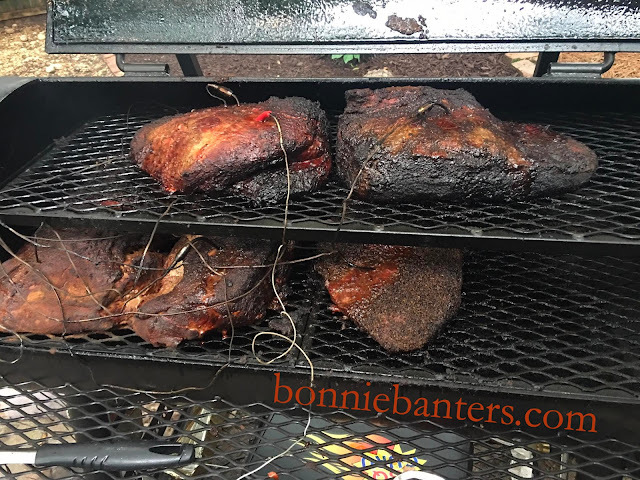 Everything that came off that smoker was unbelievable! Hats off to my son, "J.R.," the Pitmaster! My take-along dish Father's Day was this fantastic, crunchy veggie salad, which I'd been tempted to make for some time. Well, I can tell you that it was a big hit, for those who were okay with a little raw onion, that is...read on! Whisk together the sour cream, mayonnaise, vinegar, jalapeno, celery seed, salt and pepper until smooth. Set aside to let the flavors meld. Mix all the vegetables together in a large bowl. Right before serving, add the dressing (using just what you need) and gently toss until well combined. * Enjoy immediately! The original recipe called for twice the amount of jalapeno and celery seed than I used. I used less to suit the palates of most anyone; and all, who ate the salad, loved it! A couple of the diners chose not to eat the salad because they can't tolerate raw onion; so, next time, I will omit the onion for them. So, keep your diners in mind when deciding which and how much to use of these ingredients. To date, the easiest way I've discovered to cook corn on the cob is to cook it in the microwave: I placed all 4 ears of corn on a microwavable plate, with the husks on, in the microwave for 2 minutes on high. Then, I let them cool to the touch...tore the husks off and removed the hairs with a paper towel. Though I'd seen this method many times on the internet, my daughter had been using it for a while and encouraged me to try it. It was so easy, and I loved it. I hope you try this method too! The original recipe did not suggest seeding the cucumber; but seeding it made the salad even more crunchy and less likely to be watery. 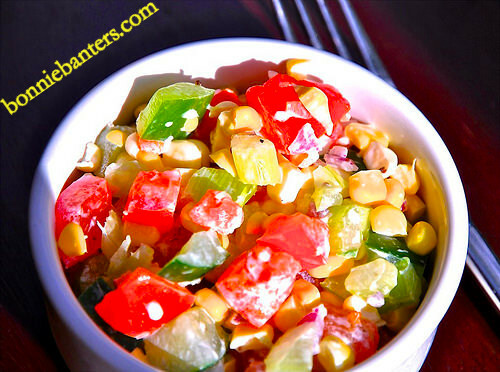 If you are taking this salad to a gathering outside the home, I recommend adding the dressing and tossing it after you arrive (as I did), so it will not get watery. They'll be passing their plates for more, when you serve this irresistible, crunchy, fresh summer salad! Enjoy! Better Get In Line At The Carving Station! Thank you! Such a great salad and fun get-together!